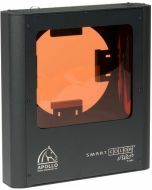 Apollo gel color filters help create mood, emotion and atmosphere by changing the color and quality of light. The gel string allows multiple colors to be easily and inexpensively changed from one production to the next. Filter colors shown are similar in hue, but different density. For accurate color match, refer to the Apollo swatchbook. 2" x 2" x 9"